Sinn Fein’s Gerry Kelly has moved away from the earlier party position which stated as fact that the UVF was behind threats in a shared housing development in south/east Belfast. The East Belfast Community Initiative, which mediates on behalf of ex combatants linked to east Belfast UVF, categorically dismissed the allegations of UVF involvement and the PSNI and families involved have since confirmed they never mentioned the UVF. Prominent journalists have now began to publicly question the genesis of the allegation of the UVF involvement and all the evidence points to the statement issued under the name of Sinn Fein’s south Belfast MLA on Thursday which stated as fact that the UVF had issued these threats. Sinn Fein were immediately supported by the Alliance party in this assertion as both parties worked in unison to stir up sinister sectarian tensions. The statement by the north Belfast MLA makes clear that the Sinn Fein position is now that the PSNI need to reveal whether there was paramilitary involvement or not. 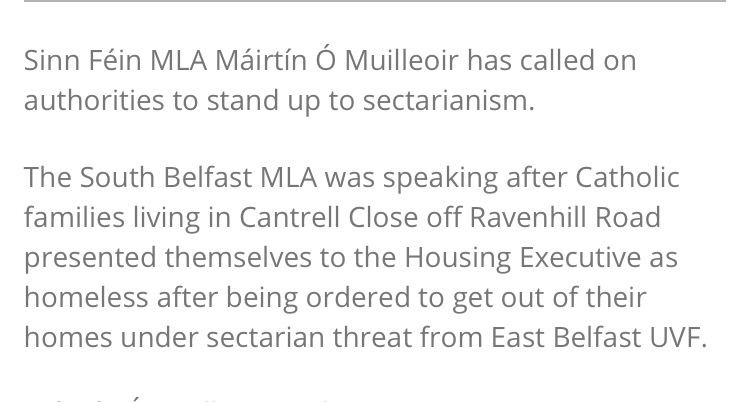 This is a significant move backwards from the statement stating as fact that the east Belfast UVF had issued the threats. The public narrative has now switched to questioning the motivations behind those who made the bogus allegations of UVF involvement, rather than the strategy envisaged by Sinn Fein which was to have a public chorus demanding that the NCA immediately move against loyalists in east Belfast. It is imperative that the spotlight remains on Sinn Fein and their surrogates in the Alliance party and they explain their motivations for adding sinister connotations to this issue. The Sinn Fein attempts to spin a story for political benefit has ended in complete embarrassment as it has spun right back around onto them. 1,842 Responses to "NEWS: Humiliated Sinn Fein retract bogus UVF threat allegation "
Thank you for the good writeup. It in reality was a leisure account it. Glance advanced to more delivered agreeable from you! However, how could we be in contact? of that, that is magnificent blog. An excellent read. I will definitely be back. four emails with the exact same comment. Perhaps there is a means you can remove me from that service? Nice post. I was checking continuously this blog and I am impressed! Very useful information particularly the last part 🙂 I care for such info much. I was seeking this certain information for a very long time. Thank you and good luck. other website which provides these things in quality? I want to get across my gratitude for your generosity in support of all those that actually need help with that area. Your special dedication to passing the message all over was particularly productive and have really allowed people just like me to get to their dreams. Your useful instruction can mean this much to me and even more to my office colleagues. With thanks; from all of us. Your means of telling all in this piece of writing is actually good, every one can easily understand it, Thanks a lot. Hey there! This is my 1st comment here so I just wanted to give a quick shout out and tell you I really enjoy reading your articles. Can you recommend any other blogs/websites/forums that deal with the same subjects? Thanks! Simply want to say your article is as surprising. The clearness on your post is simply excellent and i can suppose you’re knowledgeable in this subject. Well with your permission let me to grab your feed to stay updated with approaching post. Thank you a million and please continue the gratifying work. There are definitely lots of details like that to take into consideration. That is a nice level to bring up. I offer the thoughts above as basic inspiration however clearly there are questions like the one you convey up where crucial factor will probably be working in sincere good faith. I don?t know if best practices have emerged round issues like that, however I am certain that your job is clearly identified as a good game. Both boys and girls really feel the impact of only a second’s pleasure, for the remainder of their lives. We are a bunch of volunteers and opening a brand new scheme in our community. Your site provided us with helpful info to paintings on. You have performed an impressive activity and our entire group can be grateful to you. I want to convey my appreciation for your kindness for all those that actually need help with in this situation. Your special dedication to getting the message throughout has been particularly valuable and have all the time enabled those like me to realize their endeavors. The useful advice denotes so much to me and extremely more to my colleagues. Warm regards; from each one of us. hello there and thank you for your info – I’ve certainly picked up anything new from right here. I did alternatively experience a few technical issues using this site, since I skilled to reload the web site lots of occasions prior to I may get it to load correctly. I had been wondering in case your hosting is OK? Now not that I am complaining, however slow loading cases times will very frequently affect your placement in google and can damage your quality score if advertising and ***********|advertising|advertising|advertising and *********** with Adwords. Well I am adding this RSS to my email and could glance out for a lot more of your respective intriguing content. Make sure you replace this once more soon..
I’m usually to running a blog and i really respect your content. The article has really peaks my interest. I am going to bookmark your web site and hold checking for brand new information. this website is genuinely pleasant and the visitors are actually sharing fastidious thoughts. Hurrah! Finally I got a web site from where I can genuinely get helpful data concerning my study and knowledge.